I love stories. More than I love to see good stories portrayed in the movies or even reading good stories in a book, I enjoy creating my own stories. I just like to make stuff up or take someone else’s story and riff on it and take it to unimaginable places. Some of my favorite comics were a series called What If, as in the graphic above. The comic basically challenged our logical way of things. 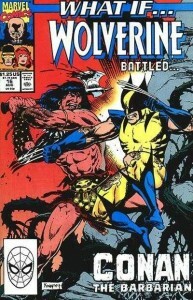 Wolverine vs Conan? What an epic battle. My story is pretty average, unless I start to “What If” it. What if I my dad had not died when I was young? What if my birth parents decided to keep me? What if I had never moved to Florida where I received Christ at a Christian Camp, met my wife, and continue speak at for the past 12 years? Alternative story lines mess with us. In pop culture it’s called fan fiction. Fan Fiction are stories by fans about popular t.v. shows , books, movies, etc and they write on going stories using very familiar characters. Alternate history can be fun and mind blowing but it can also be scary. What if I have that affair? What if I say what I really think? What if I quit the ministry? What would I do? Who would I be? All of these What If’s get the imagination rolling in good and bad ways. My guess is, all our story were made increasingly better when we encountered the Savior. For the disciples, I bet it was like half and half for them. They liked the miracles and being associated with Jesus but I bet that all came into question when that story turned into storms on the sea or feeling threatened by the Pharisees. If you are reading this, you have a story. If you don’t like the way your story is going, good news, you’re breathing, it can change, it will change. Keep moving forward with Christ and let the story unfold. If we’ll stay with Jesus all the way to the end of our story I know the ending will be totally worth it. What’s the scariest What If you can ask yourself? What is the coolest result of asking yourself What if? Have you ever changed the course of life by asking What If?